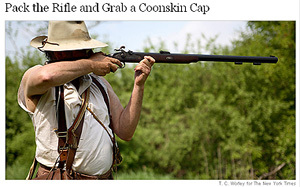 My story in today’s New York Times covers the hobby of rendezvous re-enactment. 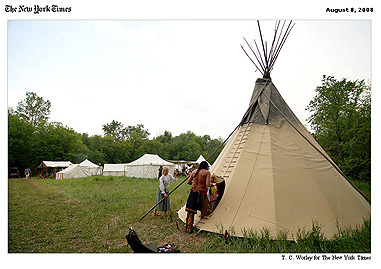 I visited a rendezvous encampment a couple months back on the banks of the Canon River in southeast Minnesota, and this story highlights my experience—including black powder rifles, hatchet throwing and the imbibing of mead—as well as delving into some background on a hobby where grown men and women dress in fur-trade period outfits, sleep in tepees or canvas tents, and turn their backs on modern civilization for a couple of days. There are dozens of rendezvous held every year in the United States, and as many as 20,000 people—men, women and children—are involved in the hobby, according to Donlyn Meyers, publisher of Smoke & Fire News, a monthly periodical that covers living-history events. The tradition is old, and the name is French for a reason. In the centuries when the fur trade dominated North America, French adventurers made their way up the rivers and lakes to the heart of the continent to meet with Indians who had pelts to trade for European goods: guns, kettles, beads, cloth, alcohol. By the early 19th century, the French dominance was gone, but the gatherings remained, larger and more varied. Enterprising explorers and mountain men, Indians, fur buyers and mercantile traders came from miles around, and the rendezvous became a festival that featured commerce, competition, whiskey and the ensuing bacchanalia of lonely men in rare communion. Go here for my full story. . .